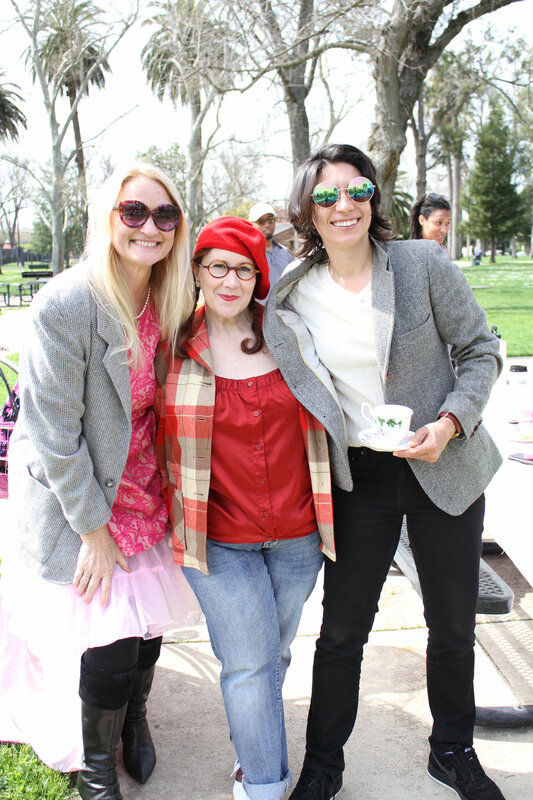 I was invited by my new Friend, Lisa Lazar to join she and her husband Robb on the Sacramento Tweed Ride. It was sort of out of the blue and we only met just twice before. I was delighted to receive the invitation and the two were the most lovely hosts you could imagine. They even loaned me bike. You can see Robb and Lisa below. Rob is the fellow on the 3 wheeled bike with a portable bar strapped on (which he built) and Lisa is the lovely lady wearing a hand knit (and hand dyed) Scandinavian cardigan. They both fall into the category of fabulous and you can read more about them on Lisa’s Blog, “How’s Robb”. She started it after Robb had a spinal injury to keep family in the loop on his progress. It’s turned into a wonderful space where she shares all her “slow living” projects - like spinning yarn and knitting a sweater from a sheep fleece. And Robb is doing great as you can see below. Ok, so the pictures skip ahead to the picnic in the middle of the ride. I should mention here, that I have not ridden a bicycle since I was fifteen (that was many many years ago, before I started dying my hair and before I went Gray!). When people say “It’s like riding a bike….” they must mean it’s going to take some time (like hours and also a fall in the first five minutes) to get used to it. So I was not snapping any photos while on the ride. I was just trying not to crash. Thankfully, Organizer Lynn Taylor came to my rescue and switched bikes with me. Lisa’s bike is a gorgeous gold vintage bike and I was sad to say goodbye to , but really happy to ride Lynn’s vintage Schwinn, which had a much lower frame. The people of the Sacramento Tweed ride were really lovely and very inclusive. Such an enjoyable group of people! And look at all those cool vintage bikes. Lisa, helping Rob unload the picnic table and bar. Rob looking Super Dapper mixing up fantastic Cocktails! Melinda Green wearing a great plaid vest and coordinating beret along with riding knickers. Robb won Most Dapper Gentleman and together they won Best Picnic. That’s Robb’s nephew in the background. and I love the Rogue Nature of this Tweedy Fellow! Devon won Best Bike because he Made it! and made his fantastic Bowler Helmut from a Teapot! This guy’s got some talent. Look at the lovely Ribbons Lynn made for the winners! They even have buttons in the centers that have a bicycle on them. What, I get a prize??? Yes, I won the “Style Maven” award for the refashion I did on my Sport Coat and for making my hat. This post is getting a little long, so I’ll do a separate detailed post or posts about the jacket and the hat. Essentially, I had two weeks to put this all together. I’ve been wanting some tweedy pieces for a while and was thrilled for the opportunity and short time frame. The timing meant that I couldn’t labor too hard on anything and I work pretty well under a deadline. Coat, pants and vest were found at the local Charity Shop -Salvation Army, here in Alameda and I made my hat. This hat is like no other I’ve made and it deserves it’s own How-To post due to the complex nature of it’s construction. These two Hannahs rode bikes in Corsetry. If ladies could do it back then, why not now? Both ensembles were made by the Hannah on the left and included lovely jackets. At this point in the day, we were all getting a little warm so the jackets appear to have been put aside. The diversity of the tweed clad troop was really fun to see and even Barbie got in on the action. Thanks to Cindy, Lynn & Julie for keeping us safe on the Ride. What a wonderful group of organizers! Wouldn’t it be fun to have a Tweed Ride in Alameda? I hope you all have a fabulous week. Until Next Time, Happy Sewing!